The long awaited Samsung Galaxy S4 landed in at DirectMobiles HQ to great excitement recently. The S4 has a lot of expectations to live up to. Its predecessor the Samsung S3 is the most successful Android handset to date. 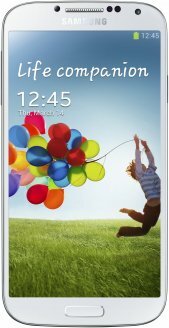 The Galaxy S4 is styled in similar fashion to the S3 and made from strong polycarbonate; the S4, however, sports a patterned rear shell which is removable to access the battery and microSD slot. Boasting a superbly sharp 5-inch, the Galaxy S4’s Super AMOLED full HD screen oozes clarity with a TV-quality resolution and is certainly a step-up from the S3 which has a 720p screen compared to the S4’s 1080p. Despite featuring a larger screen than the S3, the S4 is actually slightly slimmer and narrower with a width just under 70mm and measuring 7.9mm thick. It’s also a shade lighter than the S3 although it feels substantial when you hold it in your hand. Under the hood, the Samsung Galaxy S4 is powered by the 1.9GHz quad-core Snapdragon 600 processor, which also features in the HTC One, and comes with 2GB of RAM, 16GB of internal storage, NFC and is 4G compatible. Running on the latest 4.2.2 version of Android Jellybean, the S4 handset also boasts some new touchless features thanks to the infrared sensor. This means you can answer calls, fast forward through your music tracks or scroll through your photos by swiping your hand in front of the screen. The S4 also has Smart Scroll which enables you to scroll up and down through web pages by detecting the movement of your eyes. The other enhancements to Samsung’s software for the S4 include an improved TouchWiz UI, an improved S Health Fitness app, Air Gesture and Smart Pause. The Samsung Galaxy S4 13-megapixel main camera is full of great new features and includes Drama Shot which superimposes several images to make an action shot, Dual Shot where you can use both the rear and front cameras to take photos at the same time, Eraser Shot where you can remove people from your pictures, Best Face where the best image of faces are used from several shots to make the best picture and Beauty Face which apparently will improve people’s looks! The front 2-megapixel camera also shoots in 1080p with full HD video recording. For our superb deals on the Galaxy S4, click here for more details.